With their compact design the Mitex General is manufactured to the highest standards, giving clear and reliable communication, even in the harshest of environments. 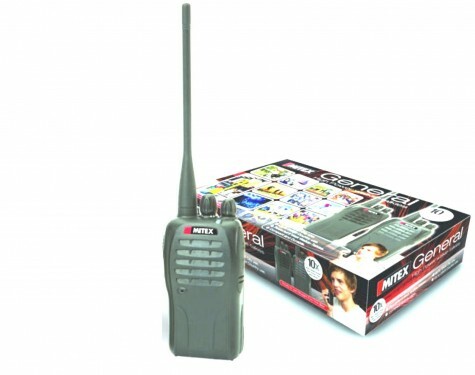 Mitex two way radios are an innovative concept in the world of radio communications. Not only does this new range of handhelds tick all the boxes of their current conventional competitors, they also offer you, the consumer, a unique “ready to use, out of the box” solution. For anyone that has suffered the frustration of poor coverage from license free alternatives, the new Mitex radio is a long awaited upgrade at a very reasonable price. For those already familiar with professional radios, Mitex offers quality, durability and ease of use at a fraction of the price of their comparable market leaders. The Mitex General two way radios are both compact and durable making them suitable for most business, lifestyle and leisure applications. With their compact design the Mitex General is manufactured to the highest standards, giving clear and reliable communication, even in the harshest of environments. Mitex walkie talkies are pre-programmed and ready to use ‘straight from the box’ offering an obvious step up from PMR446 and a simple solution to your communication requirements.